Relationships matter. Developing and building meaningful relationships with families, friends, all those we hold dear, leads to a happier life. Yet, when things go wrong and when times are tough, most of us withdraw rather than reach out. Recently, I read a book called Thanksgiving at the Inn that deals with this very subject. 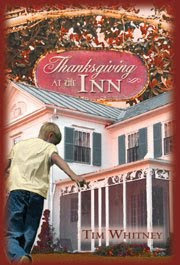 Relationships, family, forgiveness, gratitude, happiness - those themes play a central part in Thanksgiving at the Inn , Tim Whitney's heartwarming story for middle grade and young teen readers. Heath, the main character, clashes daily with his father (Junior), a withdrawn alcoholic and struggling author/carpenter. With no mother in sight, Heath does his best to abide by his father's wishes and rules but ends up getting constantly berated, always running short of his father's expectations. Junior has a hard time relating to his son, haunted by past experiences with his own father, Senior, the patriarch of the family. When Senior dies, both father and young son receive even more unsettling news. In order to inherit the family estate, they must move to back to the homestead in Massachusetts and manage Senior's unusual farmhouse bed and breakfast for three months. Things get even more interesting when they meet the current tenants, a strange group of individuals. As they adjust to the change, another tragedy forces them to consider reconciliation and, ultimately, they both grow, change and learn how to be thankful for what they have. Whitney's debut novel fills a much needed void. This character building book with wholesome messages is perfect to share with tweens/teens, both boys and girls. Thanksgiving at the Inn would also make an excellent family read-aloud, offering the following compelling discussion topics: alcoholism, autism, death, dyslexia and strained father-son relationships. The characters and plot appeal to both young and old. While it isn't exactly action packed, the coming-of-age story contains several enticing characters including a wise Jamaican man named Winsted and Mustang Sally, a tattoo-covered auto mechanic who also writes and illustrates children's books. I found only a couple minor issues with the book, both due to layout--the narrow margins may turn off some younger readers and the book cover may appeal more to adults than it would kids. Even though Thanksgiving at the Inn does take place at Thanksgiving, this isn't necessarily only a holiday read. The life lessons in the book apply to any time of the year - after all, we should be thankful every single day for what and whom we have in our lives! I had no idea this book was geared toward younger readers as well. Sounds very emotional. Thank you so much for the kind review and capturing the true spirit of how this book was intended to be read. We all have choices in this world, and you really can learn to choose happiness if you put your mind to it! Wishing you the best in 2010!